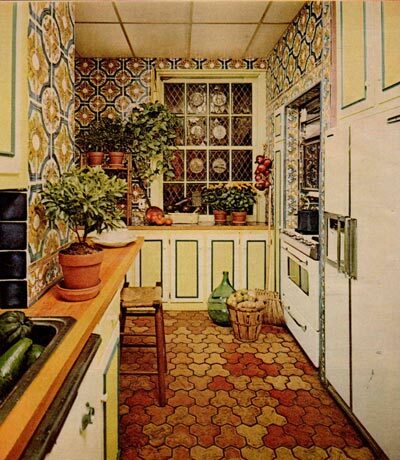 Think of a 1970s kitchen and, to my mind, it's all path-worn linoleum and avocado Formica counters. Molded plastic magnets and burnt orange Tupperware didn't stand the test of time well (at least not in the decor department... most likely they'll outlive cockroaches), so most of our moms' kitchens weren't exactly showplaces of tasteful decor. My family tried. My own childhood kitchen actually had an antique wagon wheel chained to the ceiling, with artfully arranged wooden spoons and primitive cooking utensils hanging just above the adults' heads. No oversize frying pans or five-quart Dutch ovens up there... probably a wise thing. But despite the brave attempt at interior decoration, that kitchen just wasn't pretty. Between the harvest gold refrigerator and the clunky Early American dining set, it was a room that needed a better face. This glimpse into a 1973 galley style kitchen is full of inspiration, for that vintage kitchen in my memory as well as my own today (maybe yours too). The Portuguese tile is traditional and classic, set against cabinets in fresh colors and butcher-block style countertops. Though the live plants were certainly "planted" just for the photo, the effect is beautiful and even sustainable if there's sunlight nearby. At the back wall, the stained glass panel is described as a false window to hide an "uninteresting view", and to our eyes it's a quite interesting and appealing alternative. And this kind of improvement was part and parcel of 1970s kitchen culture, not only in the decor but the cuisine. It was a time when French cooking still enjoyed a heyday. Breakfast could be as rich and rigorous as high-rise pancakes and peaches flambe`. Julia Child reigned supreme. At a time like this, even a galley kitchen like the one pictured deserved special treatment... and got it in style. Good thing they decided against a wagon wheel. Photo Source: McCall's Magazine, March 1973.